I don’t ever play S&W White Box anymore, at least not the ‘official’ version. 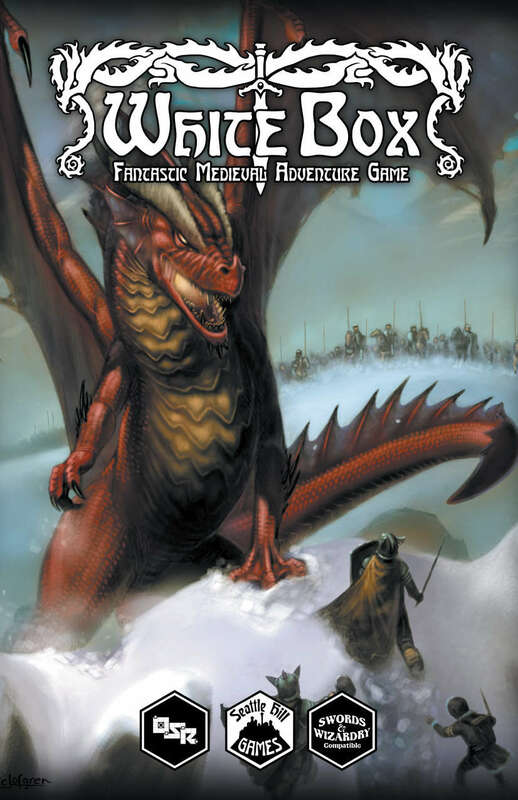 I play the much-improved S&W White Box Fantastic Medieval Adventure Game (FMAG), and have since it was released in 2016. I’ve never done a review, only because it has some of my material in it – namely the ‘essential adventuring rules‘, but suffice it to say that Charlie Mason did a great job putting together the needed improvements – errata, rules, layout and art. Anyway, I thought I’d share my house rules for the game (which can, of course, be used for ‘official’ White Box, or even OD&D). 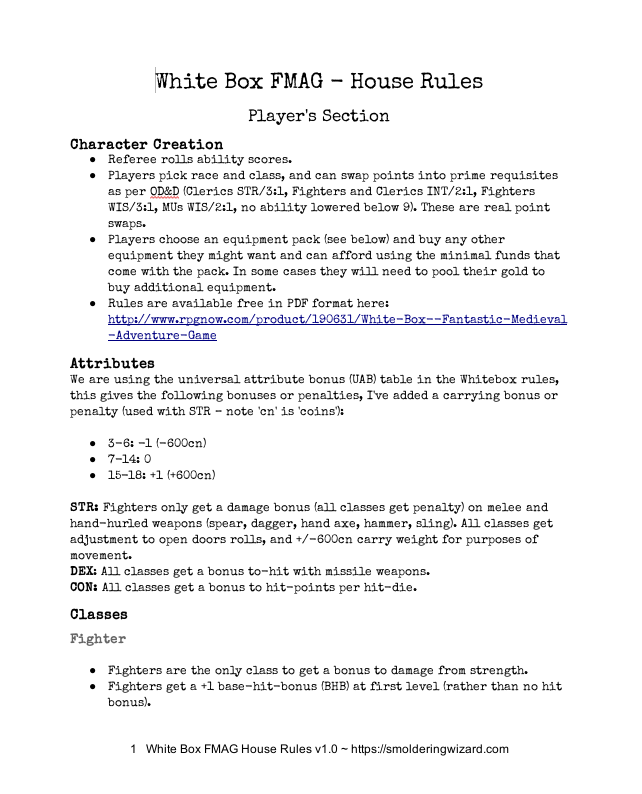 They are a streamlined version of my original house rules for S&W White Box. Encumbrance is very simple – I stole the idea from Pits & Perils that PCs can carry what is ‘reasonable’, plus 1200 coins in a large sack – no more. Adding the maximum coin weight just drops the character to the next lower movement rate. This, I think, embodies the spirit of the original game that gold equals XP, and this should influence your goals as far as avoiding combat and seeking out treasure (of course it also mirrors the original game that provided all equipment weights in coins). New to the rules are the equipment packs. I think they will be a good way to speed up character creation (not that it was slow already, but even still, equipment selection is probably the slowest part). I’m a bit stingy with the starting gold – I think this enhances the treasure hoards during that first adventure or two that might include the more expensive armor and weapons, like long bows or silver arrows. It might also encourage the PCs to pool their resources if they absolutely must have that mule or lantern or whatever. You’ll also notice Magic-Users can choose between a first-level scroll, or 50GP. I removed my rules on scroll creation, so this is a nice boon for the starting mage, if they choose it. There are two thief packs, for those who allow thieves. Here is a link to the google doc with the player and referee house rules, I left it in this format so you could download it however you like, and edit it to your taste. Or, click on the image below.